The conservation of horse-drawn vehicles has greatly evolved since 1990, today it is more common that conservation treatments be conducted in accordance with the requirements and guidelines of the International Institute of Conservation of Historic and Artistic Works. Whenever possible, original materials are retained and once stabilized are made presentable through careful cleaning, fills to losses, replacement of missing elements and careful inpainting or retouching of areas of damage to the decorative paint schemes. Augerson Art Conservation Services, working in conjunction with textile conservators and other specialists, provides such conservation of carriages and sleighs. C. Augerson, "An Archaeological Approach to Treating the Polychrome Sleigh The Turtle," Postprints of the Wooden Artifacts Group, Presented at the 32nd Annual Meeting of AIC, Washington, DC: AIC, 2004, p. 1-11. C. Augerson, "The Use of Less Toxic Solvents, in the Treatment of a Royal French Sleigh, c. 1720,," Postprints of the Wooden Artifacts Group, Presented at the 28th Annual Meeting of AIC, Washington, DC: AIC, 2000, p. 2-15. C. Augerson, "The Conservation of 'The Cattails', a Royal Sleigh at Versailles (Circa 1740)," Postprints of the Wooden Artifacts Group, Presented at the 42nd Annual Meeting of AIC, Washington, DC: AIC, 2014, p. 27-36. 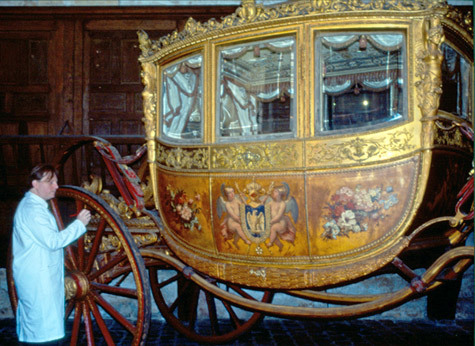 Photos: Leopard sleigh (c. 1730, Versailles Palace); "The Skaters" sleigh (c. 1720, Versailles Palace); Coupe of the Presidents of the 3rd Republic (Versailles Palace); Tom Thumb's Coupe, Tom Thumb's Chaise, Commodore Nutt's Coach (Barnum Museum); Baptismal coach of the Duke of Bordeaux (1821).